The Shotokan Shitoryu Karate Association of New Zealand (SSKANZ) was established by Sensei Johnny and Tony Ling in 1991 and was originally named Sabah Karate Association (SKA) of New Zealand. At that point, the dojo was under SKA (Malaysia) supervised by the late Shihan Dato’ James Lo. With the passing away of Shihan James in the year 2000 Sabah Karate Association of New Zealand, became an independent Karate club. The club was made exclusive to teaching only adults who are passionate about the sport. As the passion for Karate spread, the name Shotokan Karate Association of New Zealand (SKANZ) had been officially formed and re-established in 2005. At that point, the club opened the doors of its dojo to both children and adults who were either eager to start learning Karate or wanting to master this form of martial arts. It continued to teach the Shotokan way placing emphasis on the sports aspect of Karate. 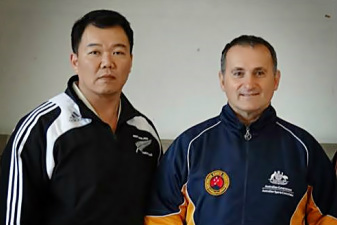 Due to the requirements from the World Karate Federation for the position of A Grade Kata Senior Referee, Sensei Johnny started to learn the Shitoryu style of Karate in 2002. He studied under Sensei Con Kassis from Melbourne, Australia who had learnt Shitoryu directly from Master Mabuni. In 2013, Sensei Johnny introduced Shitoryu kata into his teaching and the club had officially become "SSKANZ" or "Shotokan Shitoryu Karate Association of New Zealand". SSKANZ continues to be passionate in teaching the art and discipline of the “Empty hands”. The passion for Karate is being passed on from the club’s Senseis to its youngest white belt students. In the process, SSKANZ has produced national and international Karate champions and continues to successfully coach Karate athletes into winning many tournaments both locally and internationally.